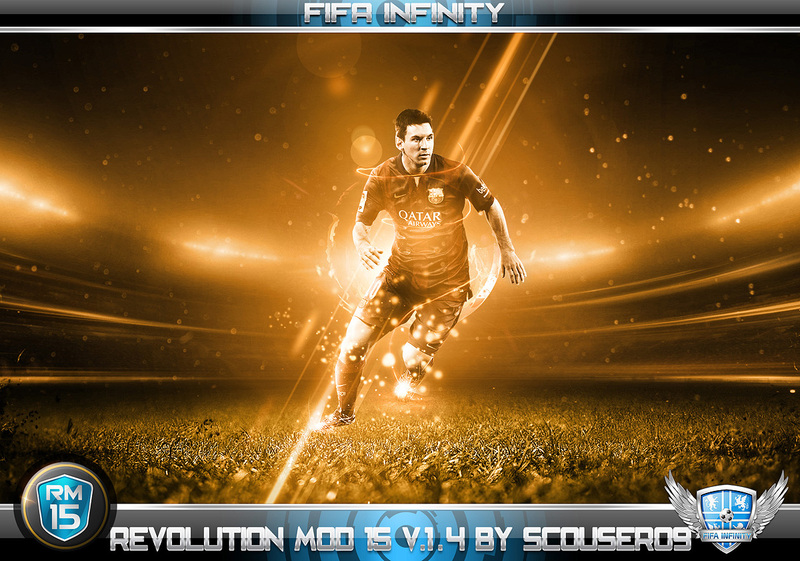 Revolution Mod 15 V1.4 is now available for download.. 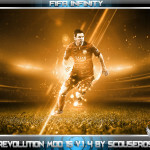 IMPORTANT: Revolution Mod 15 V1.0 must be installed before installing this version if have not already done so. You can download this version from here. -Automatic Crowd Kits (Team Home And Away). -Automatic Goalposts (Includes Net Support Posts). -Automatic Substitute Bibs And Tracksuits (Away Team Variant For Generic And Tournament Assignments). -Set Crowd LOD (Increase And Decrease). -Automatic GK Gloves And Accessories For Specific Kits (Including Alternate GK Kits). -Identify Player As GK (Allows Bench GK To Wear GK Kit). -Identify Which Kits Are Replaced With Custom Kits In FUT (Avoid Clashes When Playing Online). -Set Crowd Size For Tournaments, Teams And Matches. -All Generic Boots Are Replaced By Specific Boots. -Assign A Specific Kit (GK And Outfield) To Use For A Specific Match. -Assign Boots From New Library. -Assign Custom Assets To FUT Team. -Assign Different Textures To Static Adboards. -Assign GK Kit To Outfield Kit (Includes Randomization). -Assign Sleeve Length, Jersey Tuck, Jersey Fit, Sock Height, Undershirts, Undershorts And Winter Accessories To Players. -Assign Winter Accessories To All Referees. -Automatic Accessories (Includes Team Winter Gloves). -Automatic Adboards (Includes Adboard Randomization). -Automatic Balls (Including Winter And Snow Balls). -Automatic Banners (Home/Away, Tournaments, Specific Opponents). -Automatic Boots (Includes Boot Randomization). -Automatic Faces (Includes Bump File And Randomization). -Automatic Individual Kits (Squad Number, Player, Position In Line-Up). -Automatic Match Specific Referee Kits. -Automatic Pitch Colour, Lines, Mow Patterns And Wear Patterns. -Automatic Skin Tones (For Tattoos). -Automatic Specific GK Kits (For Teams With Generic GK Kits). -Automatic Stadiums (Texture And Models). -Automatic Substitute Bibs And Tracksuits. -Change Collar, Number And Name Fonts, Name Layout, Jersey Fit And Colours On Kits. -GK Kit Uses Same Fonts As Outfield Kit (Can Be Disabled). -Play In Tracksuits Instead Of Kits. -Referee Kits Assigned To League Tournaments Will Show In Friendly Matches. -Remove Captain’s Armband, Undershirts, Undershorts, Accessories And GK Gloves When Using Classic Kits. -Set Which Weather Conditions Winter Clothes Are Used. -Set Wipe Logos (Trophies Or 3D Tournament Logo). -Swap A Kit Type For Another. -Tournament Final Kits, Ball And Adboards. 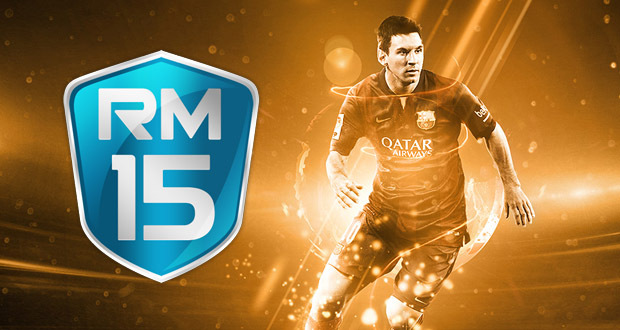 -Use Graphics Assigned To Tournaments In Friendly Matches And All Matches. -Use Name And Number Assets Of One Tournament In Another. The mod is compatible with existing careers as the database is not edited. You must read the included documentation to understand how to use this mod. IMPORTANT: Some naming conventions have changed from RM14. Read the included documentation for more information. None have changed from RM15 Beta. This version is not compatible with the Xbox 360 or PS3. You can also download an optional boot library of all original EA boots here. hello bro, i can’t install the MOD ,can you make a toutorial video ,please?.discusse to us how to install your mod. tis mod have fifa 16 overall ? ?